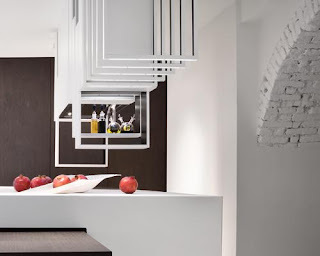 Should you find this photo of the Cut kitchen intriguing, I hope you'll take the time to watch the video that documents the design of the space and its furnishings. A motion picture is really the best way to appreciate the room, as so many of its elements—a counter/table, the bands of shelving over the island, and more—swivel, swing, and otherwise activate. The film features the kitchen's designer, architect Alessandro Isola, who provides a fascinating narrative during the tour of the room.